We've been able to apply watermarks in Aperture since the beginning, but the problem is they usually don't look the way we want. Unless you create your watermark with a transparent background, you'll get what looks like a rectangular label instead of the more elegant type without a box. Watermark with transparent background created in Photoshop, then applied in Aperture 3. The procedure for a better watermark is relatively simple. Start in Photoshop. Go to File > New, then choose "Transparent" for the Background Contents popup menu in the dialog box. Click OK. Once you've created the file with a transparent background, use the text tool to type and style your watermark. You may want to shade the text light gray instead of black (even though you do have an opacity slider later on in Aperture for fine tuning). If you want a diagonal watermark, go to Image > Image Rotation > Arbitrary and set the angle you want. Once everything looks good, then Save As Copy in the PNG format. You'll also want to save your master as a PSD file for easy editing at a later date. Now go to Aperture. 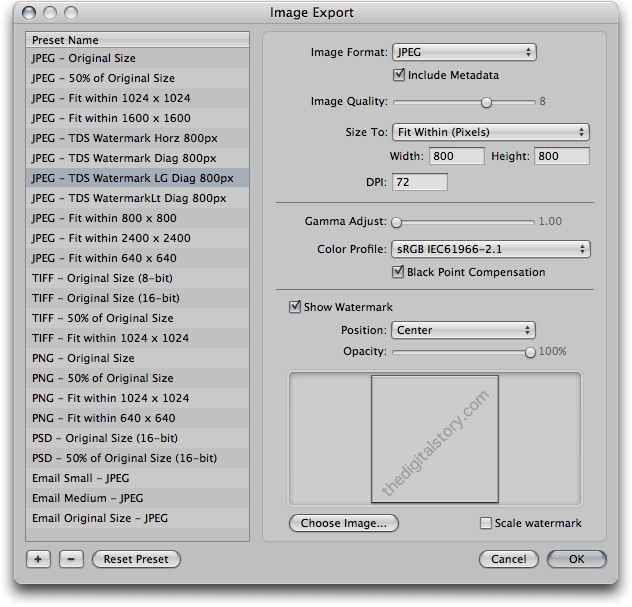 Pick the image you want to apply the watermark to, then choose File > Export > Version. In the Export dialog box, choose "Edit" at the bottom of the Export Preset popup menu. Click the "+" icon in the lower left to create a new preset. Set your basic parameters, then check the "Show Watermark" box. Click the "Choose Image" button and navigate to the graphic you created in Photoshop. If you go diagonal, you'll probably want to position it in the center. Once everything is set up to your liking, click OK, then click Export Versions. You may have to run a few tests to get everything the way you want. Once you do, you can watermark many images at once by batch exporting from Aperture. You can also set up different export presets for watermarks placed in different positions, such as lower left and lower right. I don't have to watermark often. But when I do, it's nice to have this set up ahead of time. Thanks for the article. Any suggestions on an inexpensive way to create the watermark file. Having Photoshop just to make a watermark seems extravagant. Thanks. That being said, i did look at Preview and Pages to see if I could create a file with a transparent background. And I couldn't figure out how to make it work. On thing you can do, is have someone with Photoshop create your watermark for you, then send it along. Once you have it, you can drop it into Aperture or Lightroom. If anyone has any great alternatives for creating the file with a transparent background, please share here. How about Photoshop Elements (about $80), GraphicConverter (about $40) or GIMP (free) for creating transparent backgrounds. I have Photoshop CS5 and I still use PSE and GraphicConverter for lots of stuff. I find that there are many times that I don't need the power of PS5 and one of these other programs work quite well. On some images I think that GraphicConverter does a better job at sharpening than PS5. Have found a way that is less expensive. It can be done in the current version of Photoshop Elements. Sorry to ask a question to which I should have known the answer. In my defense, I have Elements for messing with panoramas, plus occasional slicing and dicing. I use it infrequently enough that I tend to forget about its potential. At about $50, the cost is a little more palatable. For years I have been using iWatermark and recommending it to other photographers. Its fast, easy, inexpensive, and dedicated to just creating watermarks. iWatermark looks great, and the price is right at $20. Thanks for the recommendation John. The neat thing about the workflow I outlined in this article, is that the watermark is applied on export from Aperture (or Lightroom), so you don't have an extra step for watermarking. If you don't use Aperture or Lightroom, however, this looks like a wonderful solution. Thanks Derrick. I've thought about watermarking but I feel it detracts from the art of the photo. My copyright is in the exif data and I know there are services that can snif out stolen photos from the exif data. 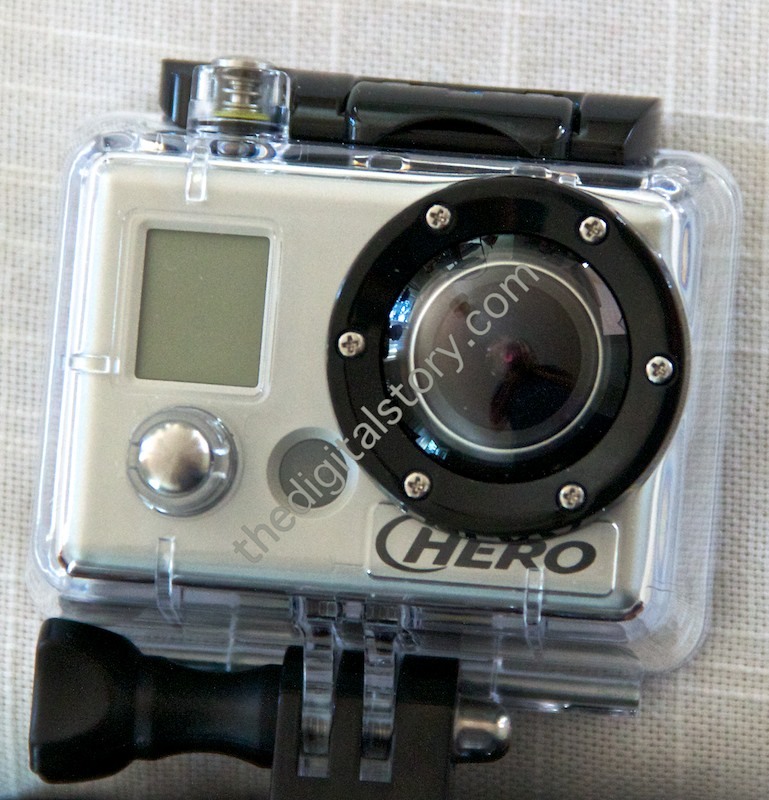 Do you really think watermarking is important?